I always file vacations under Independence. A time of outdoor exploration and inward reflection, planning and spontaneity. Upon returning from our North Shore Minnesota vacation, our family of four recapped it as a good choice all-around. We had considered Montana and Chicago as other destinations. Montana would amount to a lot of driving and with the state’s huge tourism budget, the lodges we looked at in late June for Glacier National Park were booked (You saw the bus ads and billboards, right?). We put that on the back-burner for next year. I was still holding out for Chicago, but in the end the lure of hiking and exploration won out. We opted for a local vacation to the North Shore of Lake Superior – a four hour drive from the Twin Cities to Lutsen, where we stayed. The kids had never been so far as Duluth. I had only been up north that route once in the fall, once in June for Grandma’s Marathon and a few times for winter downhill skiing. My husband estimated maybe 30 visits that direction for him. We set out on a Sunday morning for a Sunday – Wednesday vacation. It was nice to have Friday and Saturday to prep as well as a short Thursday – Friday work week upon return. At many of the lodges up north, they offer mid-week deals like three nights for the price of two, kids eat free and good twilight rates for golf. We chose Eagle Ridge in Lutsen and I’ll admit, it took me a good while to accept that it wasn’t in its all-snow covered glory. The rooms were average, but the views were all green with a glimpse of the great lake. The weather was beautiful, but chilly at times. Both kids had forgotten their sweatshirts somehow. We made due. Sunday kicked off with 1:30 lunch at Two Harbors and a 4:00 check-in at Eagle Ridge Resort. We headed to Papa Charlie’s, the restaurant on site, around 6:30, but no one was hungry quite yet. By the time we worked up an appetite, it was nearly 9:00 and the Coho Cafe in Tofte, just seven miles south of Lutsen, was closing. We headed one more stop south on the route to the Bluefin Grille. Husband Chad was hesitant — the place looked pretty fancy. I reminded him it was a Sunday night and that we were on vacation. They might have had a kids’ menu, but the late night happy hour menu looked interesting and shareable. Two bacon and cheddar and two bbq’d pork with coleslaw sliders, fried onion green beans, green salad and cheese empanadas later, everyone, except 6-yr-old Calvin who was sleeping, was satisfied. I think the tab came to $26. Super reasonable. Monday morning, after coffee doused with creme to kill the unmistakable hotel water flavor (note, remember to bring in water always), we headed to Cascade River State Park for a hike on the Superior National Trail. We didn’t have a map, so relied on signage. I felt we could have been more prepared – had we not learned from previous hiking experiences that you need to plan? The views along the trail, high above the river whose water and foam is likened to a rootbeer float, lasted 15 minutes before we diverged away from the river to Lookout Mountain. We made it halfway to a significant vista to make it feel like the summit, popped a few gummi bears, and headed back. All total, 1.5 hours worth. Another 20 minutes north and we arrived in Grand Marais, starving. We grabbed a few sandwiches to split and drove up the coast a bit more. This town was reminiscent of small town Alaska for me. We parked on the pier by the U.S. Coast Guard Station, skipped some rocks, built some rock structures and climbed the lighthouse steps. We spent a few hours there, then ventured into town to pay a visit to the Angry Trout. It was here my normally extatic son, ready to eat at a moment’s notice, was experiencing the first of high fever and exhaustion spikes. He pouted a bit and whined and we coined the term Trout Lip. After a mandatory late aft nap, we headed back to the arcade within close walking distance at Papa Charlie’s for Ms PacMan, Arctic Cat, golf, darts and the like. Calvin assured me he was up for it. We stayed close to camp that eve, heading to the shared campfire area that hosted Eagle Ridge’s nightly gathering with complimentary stuff for s’mores. We met some nice folk there, perfected golden brown marshmallow roasting and toasted some hot dogs. A bubbly woman from Prior Lake, of grandmotherly age, gushed, “are you all here on Crowd Cut?” … “no we’re not here on the Crowd Cut,” admittedly they had never even heard of it. By Tuesday, Calvin’s temp was really climbing and his patience with the outdoors was waning. While my husband and 8-yr-old daughter hiked, I hung back so Calvin could take the mid-morning nap he so needed. We bypassed canoeing, golf and hiking and opted for the Gondola ride across the ski trails of Lutsen to the top of Moose Mountain and the Summit Chalet. We packed a lunch and left around 10:30. Tickets were a bit pricey, but we decided worth it. The views were spectacular and the thrill of the gondola was entertainment enough for the kids. More napping for Calvin. He was not going to cut our vacation short! He was rested and well enough, once again, for Buck Hunter and Arctic Cat around 4:30. Kids could eat free with an adult entree purchase at Papa Charlies for our entire stay. We didn’t take advantage of this once due to kids menu burn-out at the end of summer. We ordered a lone app from Papa’s, otherwise ate our stash from Trader Joe’s we brought and three nice meals of all grown-up stuff and shared everything. Tonight, we hit the Coho Cafe in Tofte around 6:00 for pizza, ravioli and dessert, right from the dessert bar. Completely satisfying meal. We checked out around 10:00am Wednesday and headed back with a few stops to see Split Rock Lighthouse, just newly listed on the National Register of Historic Landmarks as of August 15, 2011, and a visit to Vitta Pizza, just opened mid-June this year, in downtown Duluth. Calvin was barely holding out – feverish and shivering for the last part of the drive. Without passing go (our home), we went straight to the pediatrician and got in a visit before closing time. No ear infection, pneumonia or strep, just a six-day virus. Fantastic! Lesson learned: pre-vacation planning and resting are a necessity to make things go smoothly. Calvin’s fever might have set us back a bit from original plans, but we probably got more rest than we normally would on vacation, if you look on the bright side. As far as location, up north for Twin Citians is a good deal (see Minnesota Monthly August 2011 for statewide ideas). We agreed that trips to far-off destinations are one thing, but exploring what’s right outside your backdoor is a whole other enlightening idea. “It took 3,000 years for them to make it to Minnesota, and in only a few short days, they’ll be going away,” says the Science Museum of Minnesota, referring to The King Tut Exhibit’s closing on September 5. It’s been in town since May and just last Saturday we checked it off our Summer to-do list. I had also been toying around with becoming members of the museum. The kids, 6 and 8 now, seemed ready to graduate from the Children’s Museum to the Science Museum. An annual membership for a family starts at $100. The pricing for the exhibit for non-members is $30 for adults and $18 for kids, which would have been $66 for the three of us. After I discovered the one children’s ticket free with adult purchase promo if you visit after 3:00, it seemed like an opportune time to join. We arrived in St. Paul at 3:30 and for $1.50, parked at an hour-long meter along 4th street, just a one and half block walk to the museum. Meters are only enforced until 4:30, so on that particular street, there were like 10 open spots when we arrived. We left our picnic lunch in the cooler in the car. The ramp is a nice option too. I was going for cost-saving measures to offset membership purchase this time around. A short wait in line later, the museum person helping me confirmed the promo deal for members too: $18 for me, one kid free and the other for $14 for $32 total. Plus you always get in free and omnitheater movies are free too. We got wristbands for the 4:00 entrance and paid $6 for one audio tour headset (I didn’t think necessary to buy 3 for each of us). We entered the exhibit and Harrison Ford walked us through a brief history and prepped us for the exhibit. The museum suggests allowing for 1.5hours to go through the exhibit. We were there that plus 15 minutes – possibly sharing the audio tour added some time. They billed it as the greatest archaeology discovery of all time. The boy king, Tut for short, Tutankhamun (pronounced toot-in-common) for long, reigns over other pharaohs because his body and the riches and discoveries in his tomb were so significant. The kids mostly liked the different masks and headdress, especially the nemes headdress, the striped head cloth and the animals used in symbolism. The painstaking efforts these people living in 1333BC used to conceal and protect their deceased kings, seemed to capture the kids’ attention most. Ava liked the gold and jewelry. Calvin was all about the mummy and video, showing the extraction of DNA from King Tut and several mummies. Important because in February 2010, DNA tests confirmed that he was the son of Akhentan. The intersection of science and history. This got us thinking a bit. As we exited the exhibit, the gift shop was eye candy for them. There was a really cool hidden treasures book Ava tried to sell me on, but Calvin had quickly deferred our attention to the hieroglyphics vending machine. I happily fed it a dollar per kid to spit out their name in hieroglyphics with a secret decoder. We meandered a bit through the museum on the riverfront to scope out the Big Back Yard for a future mini golf outing then headed back to the car. It was time for a snack. We took our small-pack cooler and walked through Rice Park and landed on the triangle square by Landmark Center and Lawson Commons. A few Charles Schultz’ bronzed Peanuts statues we called Chocolate Peanuts, served as a jungle gym and nearly an hour’s worth of entertainment. Some characters strolled through. An Indian family said they were just at an Indian festival at the State Capitol. Which had the kids questioning, who were our ancestors? and where was our family festival? I assured them I would look into Norwegian, Bohemian, Danish and Scottish festivals when we returned home. What do we in 2011 have in common with this boy king and the way people lived in 1333BC? We settled on a main commonality: as humans, we want to know where we come from and how we will somehow live on long after we’re gone in some way, however big or small. Somehow my 6-yr-old son, Calvin had the impression that every ball player for the Saint Paul Saints was a Twins wanna be. 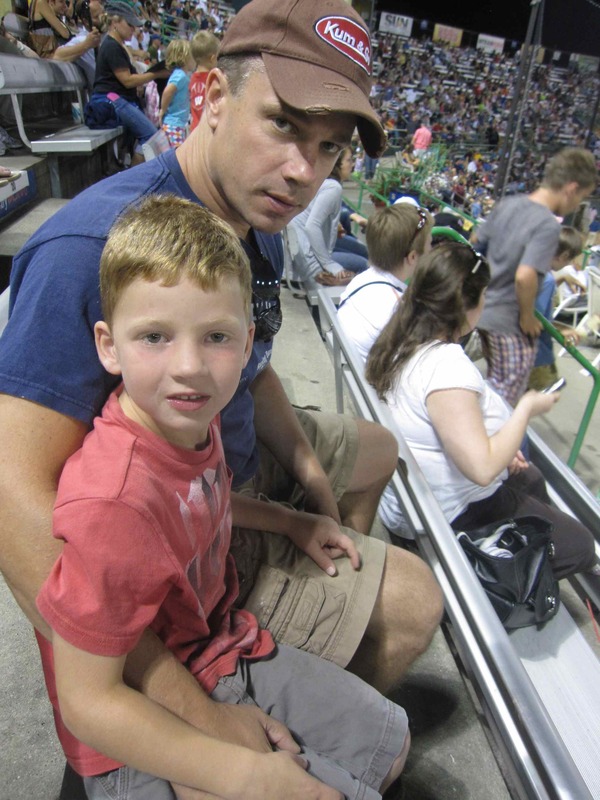 Our first family outing there was August 11 and it was a constant comparison between what Calvin had known as a Twins fan in numerous visits to the stadium and tuning in at home to the unknown Saints. My 8-yr-old daughter, Ava, was less enthused, but nonetheless pleased to be heading to a new venue with the anticipation of all the things baseball surrounding the actual game. The ballpark has a small-town feel. It might have been good to arrive a bit early for parking purposes and pre-game, but even arriving at 6:55 for a 7:05 game was manageable. The kids and I got dropped off right at the door, while my husband parked the car. There was free parking on the street. Many seasoned Saints fans biked to the ballpark. No lines when we arrived at 7:02. The kids got wooden airplanes to make and a mystery amount (either $1 or $100) gift card from Old Chicago. Calvin wanted to leave and head there immediately to find out how much pizza that could buy us. Luckily, the stadium held plenty of food, beverages and treats in store for us – some local and interesting. When could we get food? the kids wondered. We found our seats to watch a few innings first before diving into that question (to avoid the eat all your movie popcorn before the show even starts type scenario). 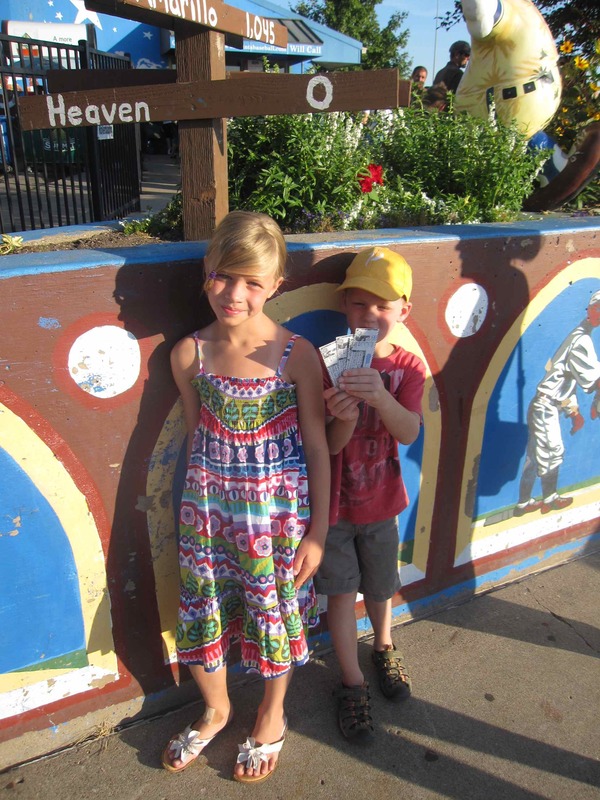 The ballpark’s personalities – Elvis, the Coach and Gert the Flirt – to name a few, captured my kids’ attention. Was it okay to behave like this at a game? …boy, they are really making fools of themselves, as Gert planted a red-lipsticked kiss on a fan. The seats kept filling up, groups leisurely rolling in from the Landshark deck and environs with a cold one. Vendors walking by with caramel apples, popcorn and cotton candy. We wouldn’t be holding out much longer. A couple and their small children – ages 2 and 4 – maybe, sit down in front of us. The stands are maybe two-thirds full at this point. Let’s turn our attention to baseball. The train chugs by in the background, the between-innings antics begin. Three girls make paper airplanes and launch them to see whose will go farthest and win a trip from Sun Country. Okay, now for some baseball. The Saints crack a few foul balls in our direction this inning. You can bet Ava is paying attention to that. Calvin is following more of what’s going on, having just come off a season of t-ball. How does the bat boy get that job? Also observing, the pitches look the same, the players have cool uniforms, they are really fast runners. What’s the difference between Saints and Twins? Ava needs a hotdog. Her and I head out in search. Bit of a line at concessions around the fourth inning and a few other pit stops put us back in our seats 20 minutes later. Next up cotton candy. They inhale the stuff and are the envy of the 2-yr-old in front of us that is near breakdown. That family decides it’s time to head out. They calmly do so, knowing they enjoyed about as much of the ballgame as they would be able to. I am glad to be past those days in this respect. Saints are up. 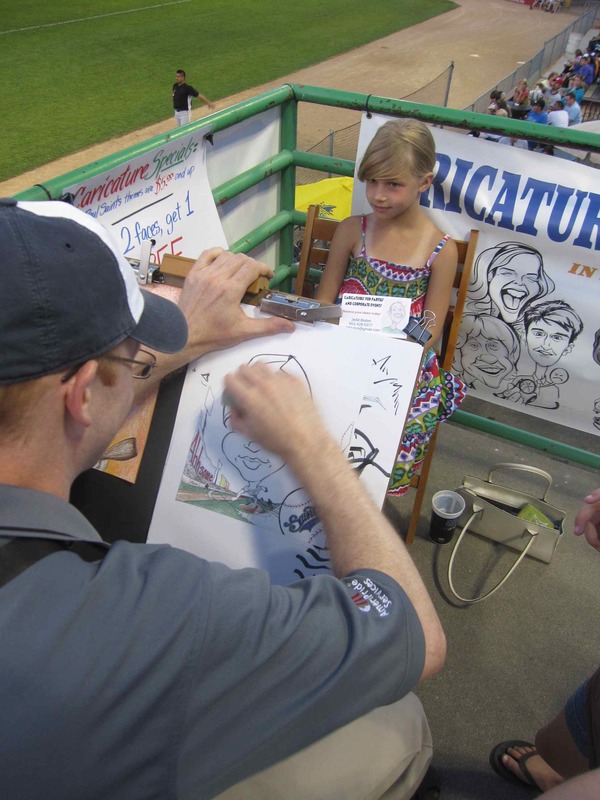 Ava has had her sights on the caricaturist since arrival. For $10 she chooses a back-drop – a muscular version of a player pitching from the mound. She sits contently for it and it pretty pleased with the result. We return to our seats. Oh wait, where’s my thing that I get, asks Calvin. Only fair, answers Dad. They set off and return with a Saints baseball bat, rootbeer and peanuts. Happy. It’s nearing 9:30 and past their bedtime. We decide to leave at the top of the eighth. Calvin does not like this plan. Wow, is he crabby. He doesn’t like to leave things unfinished. He’s whiny in the car. But, a-ha, the Saints are on 1330am radio. We listen as they pull out the win against the Winnipeg Wingnuts 8 to 7. Now, Calvin will sleep well. The Saints have have a good thing going in St. Paul, except that the park is sinking, there are not adequate locker rooms and it’s not designed for people with disabilities. If you’re a Saint, you might not wanna be a Twins player, but you sure have stadium envy, thinking about what this team could do and how the spectator experience would be heightened in a new ballpark. 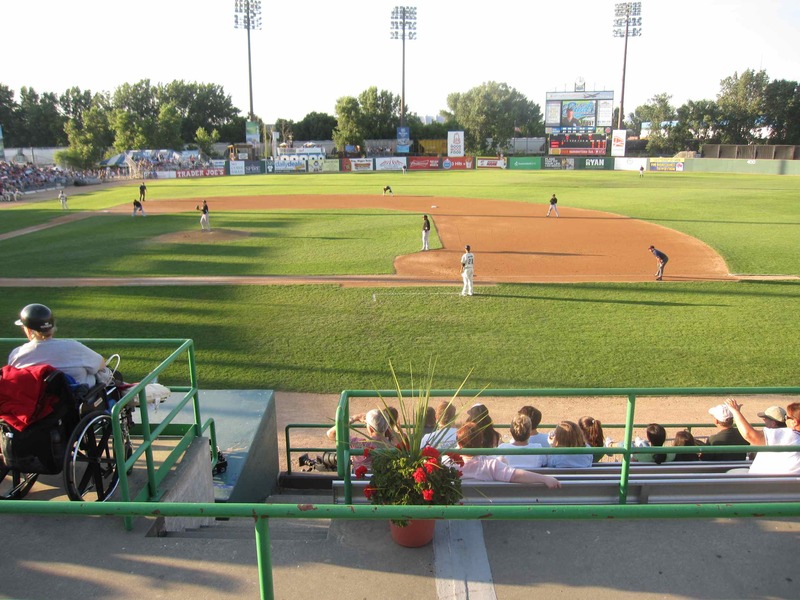 The Saints have created a culture for casual, affordable, family-friendly outings, unique in comparison to the Twins and worth a visit to experience all things baseball. We went to the Walker Open Field, Sculpture Garden and even hit the Uptown Art Fair last weekend. I took lots of pictures, but you won’t see them. I no longer have them. In fact thousands of pictures of my kids, friends and family since early 2010 were on my laptop that was swiped from my desk at my office while I was in an afternoon meeting. I thought I had sufficient back-up for all of these files. Not true, not even close. I’m emotionally drained from the week and the implications of all of my missing work and personal data are just beginning. Shock. Anger. Frustration. Soon I hope to get to namaste and leave it all behind. I need to move on. 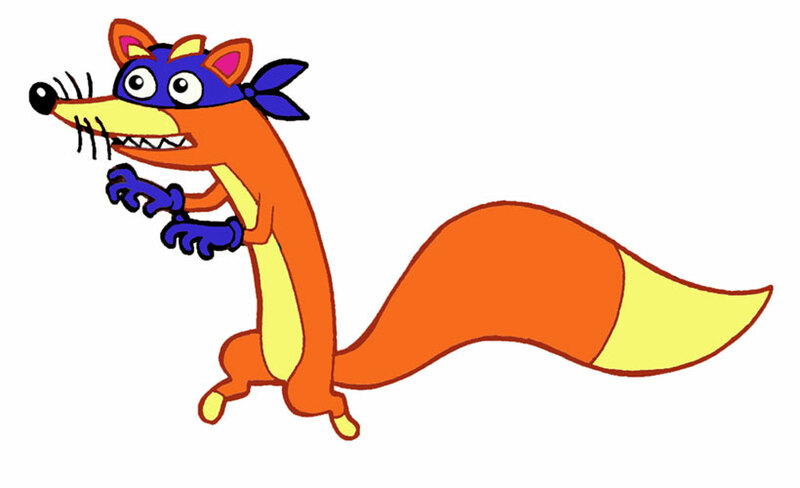 As my kids learned early and oft with the lurking Swiper the Fox of Dora, that it is not polite or ethical to steal. We have turned this “swiper” incident into a lesson – back-up your information, store it in several locations and be careful with your personal information. Pay attention to your surroundings. Because of my obsession with the thief this week, I’m making some heightened observations as I wonder what motivates a person to steal and if there is any remorse on their part after. Do they sleep better at night assuming people have all of their info backed up and that insurance will cover the cost of items lost? Because I haven’t slept well all week. Luckily my kids came back from their mini-vacation on Wednesday and lightened up my sour mood. Just to make me feel better, they hammed it up for the camera and were completely willing to smile nicely for me. While everything is still a significant loss in my book, I am seeking out the positive. So you just have to take my word for it. We were at Walker Open Field and the Uptown Art Fair and we had a blast! During the summer, Open Field takes the majority of their monthly First Saturday free family day activities outside. We missed June and July Saturdays, but iffy weather moved those indoors anyway. It was a warm summer day on August 6. My Mom, the kids and I arrived at the Walker around 10:30 and parked near the Flat Pak House and walked through the Sculpture Garden to Open Field. The theme for today was LARP (Live Action Role Playing). The kids and I tried on some fabulous masks used at the Soap Factory and talked with illustrators. With that inspiration, the kids created their own swords and shields. Sara, a WAC volunteer and student, helped Ava with hers and I helped Calvin with his. They had even thought to bring simple cloaks the kids could slip on. A volunteer brought us back to the flickr station. At least I dug up the photos from the LARPing – these kids (and grown-ups too) are so creative! They dueled it out in the area roped off just for that purpose. Ava’s Fierce Snowy Owl shield protected her and Calvin’s lightsaber-like sword took down opponents swiftly. It’s fun to take a teenager down! I had a video of that too. We had lunch from the grill outside, made a quick stop to the spell-making tent and headed south to the Uptown Art Fair. What a zoo – which I knew. I had lived in the area in my college days. Upon a quick survey of crowds and parking, I left it open for a go/no-go decision. Surprisingly, a spot right outside of Isles Bun & Coffee Co awaited us. Ava quizzed all of the artists and collected their cards. Artists from all over the country in all different mediums. Northern Clay Center was there too on the library’s rooftop, complete with potter’s wheels and instructors on hand to help people make their own works of art. We now get to look forward to a drive to their center to pick up the finished works of art in August. One banana smoothie later, around 2:15, we called it a day. Although photos are lost on the day, our memories are not erased. So I will move on, taking snapshots per the usual. I will not let Swiper get the best of us – we are explorers and have many more adventures awaiting us. Vamanos! We were on the wimpy kid bandwagon early on with books, but it wasn’t until recently that we discovered the one of the movies of the same name. 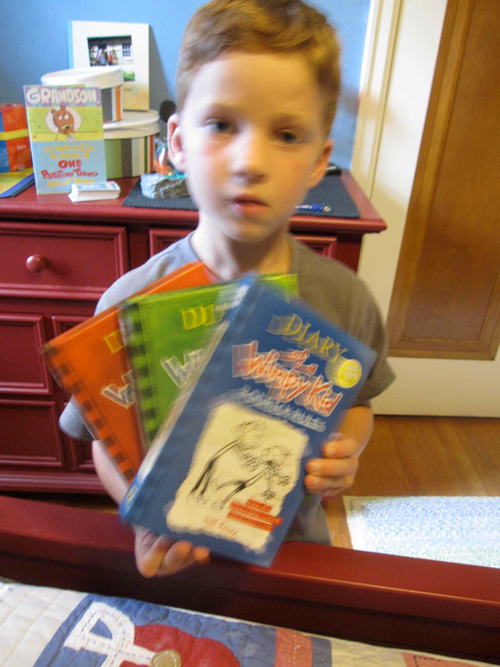 We’ve got three of the books: Diary of a Wimpy Kid (the original; movie 1), The Last Straw and Rodrick Rules (movie 2). There’s also Dog Days and the Ugly Truth with Cabin Fever coming out in 102 days, 3 hours, 48 minutes and 04 seconds. We got into the first Wimpy Kid in January. Greg Heffley, the wimpy kid himself, is a pretty average middle-schooler. Kinney, the mastermind behind the Wimpy Kid series, sets Greg up with a younger and older brother so there’s a lot of good content and commentary on sibling rivalry and its trials. My kids at 6 and 8 might be a little young for some of the situations the kid experiences, but when they get there, they might find comfort in knowing that awkwardness and embarrassment are just part of growing up. Maybe they’ll re-read the wimpy series with new perspective. Right now, they’re reading. And this is good. 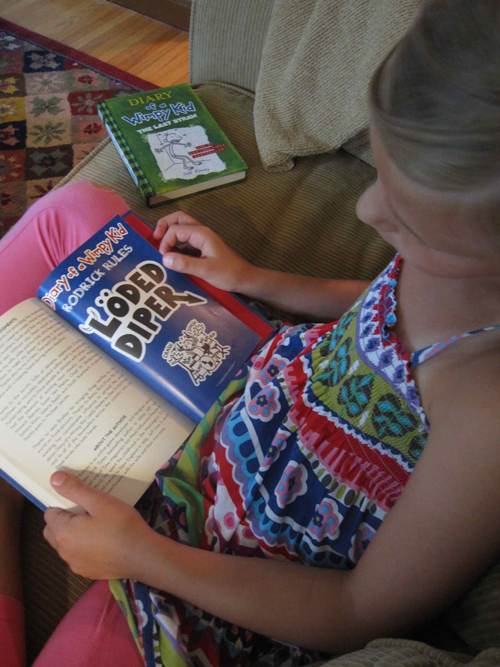 While my soon-to-be third grader, Ava, is sleuthing with Nancy Drew and alternately siding with Ivy and Bean, my 6-yr-old son is more hard-pressed to sit still and read. He doesn’t like to trust even the sight words yet, relying on the sound out each letter method. He wants to get it right. So serious. That’s why these books have been good for him – I hear him laughing. Likely pleased with himself too. I’m hoping Greg’s antics – like faking an injury for attention – don’t give him ideas. Then there’s some bad language used that I really don’t want to hear coming out of my kids’ mouths. So if I don’t like to see bad language in writing, why might I allow it on screen? Well, they wore me down (it’s been out since late March). I was still a bit reluctant when we rented the movie – Diary of a Wimpy Kid: Rodrick Rules. Turns out it was good enough to watch three times (it was a miserably hot weekend anyway). The Wimpy Kid is a fine young actor, but Rodrick really stole the show for me as the feared, older, tormenting teenager. He was relentless in pursuit of maxing out laziness and perfecting how to get out of his homework. Obviously, as the drummer in Loded Diper, he had no time for school. My kids seem to eat this stuff up – Wow, Rodrick and Jeff had a party while the parents were away? What were Rodrick’s top ten ways to be lazy? Rewind. In between each slacker idea on the list, Rodrick connects with the camera – think Ferris Bueller’s Day Off – twirls his drumstick and gives a convincing sell. Greg follows Rodrick as he shows him the ropes, ganging up on unsuspecting people leaving a convenient store who discover a gel mold of reusable vomit. They also eat an insane amount of junk food and mess up so badly on the most simple tasks given to them by their parents, that the exasperated parents just do it themselves. Post movie the kids mimic Rodrick’s list delivery, incorporating some of their new taekwondo moves. Ava says she thinks Rodrick is s-weet. Uh-oh. But I agree – he’s charming. Oh, also there’s a cool mom too – she lays on the Julia Louis-Dreyfus dance moves pretty thick (not cool: Mom Bucks). And, finally, the boys who have been at odds most of the movie become best buds. 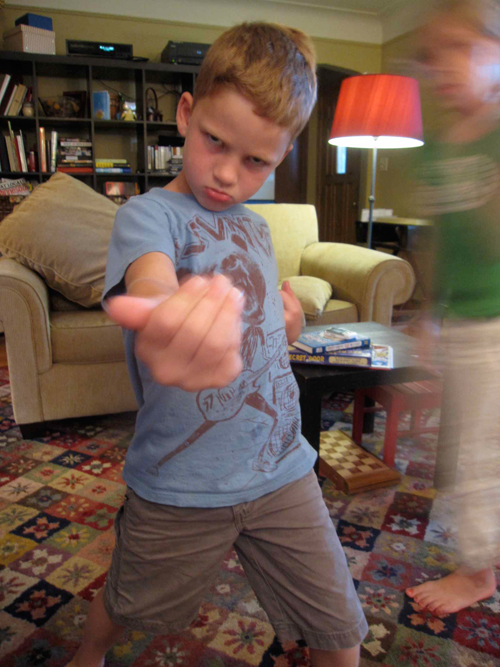 The kids and I have some conversation about why most siblings just are this way – – between states of blissful camaraderie, or fighting, door-slamming annoyance. I cue them in: It’s only the beginning of their story.